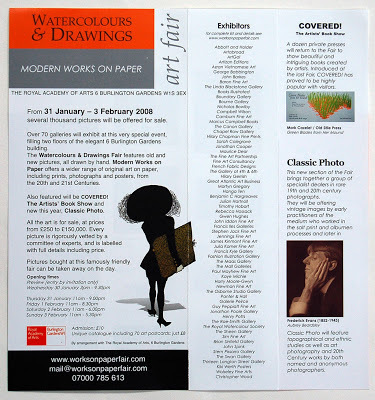 For the first time last year, a small number of Private Presses including The Old Stile Press, participated in the exhibition, Covered!, alongside art galleries showing paintings, drawings and prints at the Modern Works on Paper part of the Watercolours and Drawings Fair at The Royal Academy, in London. The venture was a great success and is to be repeated from 31st January – 3 February 2008. Full details are given on this sheet (we hope a click will render it legible) and we are proud that Mark Cazalet’s titlepage for Green Blades (which will be shown first at this Fair) was chosen to represent this part of the event. If any of our friends are able to attend the show, we can send them an ‘Invitation’.